If you’ve ever struggled to make sense of your utility bill, you’ll appreciate the information provided by advanced metering infrastructure (AMI) systems that meticulously track water usage and provide you with meaningful data. No longer will you ask yourself how much water you used in a day or when you used all of this water when reviewing your water utility bill. By providing key trends in water usage, AMI systems drive water conservation and influence change by providing you with answers. With 24 readings a day, as opposed to a few per year, AMI systems help provide a reliable baseline for comparison. Consumption data is automatically transmitted from the meter via a transmission system — up to 24 times per day! Each water meter is equipped with an electronic encoder register that is connected to a device (an endpoint) capable of transmitting data from the meter through a network. Customers can access their water use data 24/7 through the web and through smartphone apps. Data provided by the AMI system can also alert water utilities about suspicious changes in water use and trigger early response. This helps identify leaks in the distribution network before water even reaches a residence or commercial location. Most utilities estimate that 10% to 30% of distributed water is lost due to leaks before it even reaches customer meters. With acoustic loggers, even small leaks are identified early, and the devices can be used to monitor hundreds of miles of piping from the office. AMI systems provide data that can change customer behavior for the better and influence people to conserve water. Some water utilities already use AMI systems to provide usage histories to customers of their accounts online. That way, customers know how and when they’re using the most water and where to focus their conservation efforts. 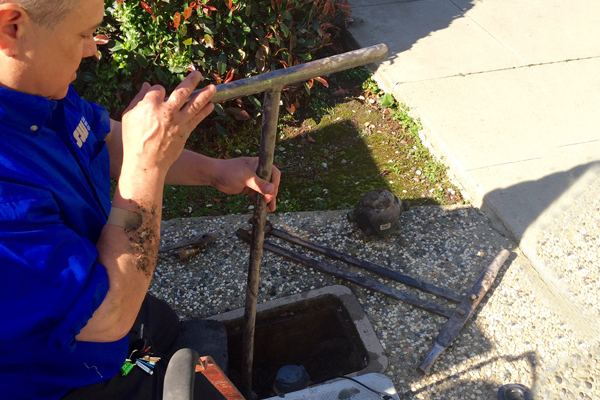 San Jose Water (SJW) is embracing this new technology by piloting new AMI meters in the Willow Glen area of San Jose. Two adjacent meter reading routes have been selected to be part of an AMI pilot project. About 400 homes in each neighborhood will receive different meters that use AMI technology. One year of water usage data for each customer account will be gathered to allow for analysis of water use trends — pre-AMI compared to usage during the pilot. A control group from a nearby neighborhood will be used to compare usage of customers without AMI meters. The AMI pilot is a research project approved by the California Public Utilities Commission (CPUC). SJW wants to carefully evaluate the efficacy of the meters, the technology and the data. Meters are currently being installed and results will be tabulated through mid-2017. The CPUC will evaluate the results and determine if a full deployment of AMI technology is appropriate for SJW. AMI systems measure water “in” versus metered water for utilities, so malfunctions and device tampering are evident and taken care of quickly. And this isn’t only about accurate reporting. Believe it or not, you use more if you’re not metered. According to an Alliance for Water Efficiency report, metered customers use on average 15% to 20% less water than unmetered customers. With AMI systems, SJW will be able to provide customers with the latest information about their home water use. When you call our Customer Service department with a question, our representatives will see the exact same information as you see on your online portal. Gone will be the days of waiting two months for a bill to find high usage or waiting for field service personnel to drive to your home to read your meter or check for leaks. This will enhance the customer service experience and provide better information for customers. Learn more tips and guidelines for ways to conserve water in your home on the SJW website here.